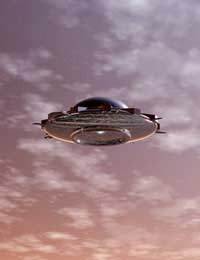 Kenneth Arnold’s 1947 sighting of something strange in the skies over Washington State launched the modern UFO age. It was on June 24th 1947 when Arnold, a successful 32 year-old businessman flying his own private plane, was on his way home to Washington from Oregon. He noticed something very strange beside him in the sky. At a distance Arnold estimated at 20-25 miles, nine crescent-shaped objects, moving in a V formation, sped past the nearby Mount Rainier. Their rate of movement seemed to be tremendous. Arnold watched in amazement and noted curiously that some of the objects appeared to be darker than the others. As he continued on his journey, Arnold jabbered excitedly over the radio about what he had seen and made some effort to calculate the speed of the objects based on his estimate of the distance they had travelled in the time they were in view. His calculations came out at 1200 mph – more than twice as fast as any aircraft then available. When Arnold arrived at his destination, there was already a crowd of pilots and airport personnel waiting to hear his account. Over the next few days and weeks, it spread through newspaper stories and radio interviews. In these, Arnold described the objects in various ways. One phrase he used had a particular resonance – “they flew like a saucer would if you skipped it across the water”. With this phrase, Arnold meant to describe, not the shape of the objects, but their undulating pattern of movement. They seemed to him to have a slight dipping and rising motion. In their headlines and articles, journalists turned Arnold’s description into the much simpler “flying saucer” and a world-conquering phrase was born. Arnold himself wasn’t sure what to make of what he had seen. The association between UFOs and the concept of extra-terrestrial vehicles is now strongly established but, back in 1947, that just wasn’t the case. Remember that it was only two years since the Second World War had ended. The war had seen rapid technological change and some startling new developments in military technology. At first, Arnold thought that his own government was responsible and the flying saucers must be some secret military project. Over time, however, his views changed and he came to favour the extra-terrestrial hypothesis. In 1952, he expounded these views in a book called The Coming of the Saucers. Modern evaluations of the Arnold sighting tend towards the sceptical. Even among the ranks of UFO believers, there are many who refuse to take it seriously. A common interpretation is that what Arnold really saw was a flock of birds. Birds move in formation, have something like a crescent moon shape; have differences in colouring; and would have the rising and dipping motion that Arnold described. Some highly suggestive words and phrases were used later by Arnold in describing what he had seen. In an article he wrote in 1948, Arnold said the objects “flew like many times I have observed geese to fly in a rather diagonal chain-like line as if they were linked together,” and in a 1950 interview with broadcaster Edward R. Murrow, when recalling the motion of the objects, he used the word “fluttered.” Interestingly, Murrow also noted in the same interview that Arnold claimed to have seen the same objects on three other occasions. Could it be that Kenneth Arnold saw nothing more than a flock of birds? This would, of course, imply that his judgement about sizes and distances had been spectacularly off. Meteors, mirages, and drops of rain on his window are among some of the other explanations which have been offered to explain Kenneth Arnold’s sighting. In response to the sceptics, it has to be noted that several other witnesses from around the same time in the same approximate area claimed to have seen flying objects corresponding to Arnold’s description. The initial public excitement stoked up by Kenneth Arnold’s sighting in June 1947 was magnified a few weeks later by the incident in Roswell, New Mexico. The Press had found a new sensation and the Saucer Age was born.